If you’re shopping for a weight distribution hitch, I applaud you and want to say: Get ready for a smoother and safer ride! A weight distribution hitch with sway control will not only improve steering and stopping of your vehicle and trailer, but also correct trailer sway that you might have experienced on the road. To me, it’s a product for the safety of myself and my passengers more than anything else. The way it makes your ride smoother is just a plus. Before we shop for a weight distribution hitch with sway control, we need to know what it is and how it works. I assume that some of you know what they do but if you don’t, scroll down to the FAQ where I will go through the benefits of having one and what you need to think about while using one. Even if you know what they are but aren’t sure if you need one, I’ll tell you that if your trailer weight is more than 50 percent of your vehicle’s weight, it’s recommended to get a weight distribution hitch. You should also note that there is a difference between weight distribution and sway control. Most products on the market today are both as they’re both recommended, but make sure you’re getting both. 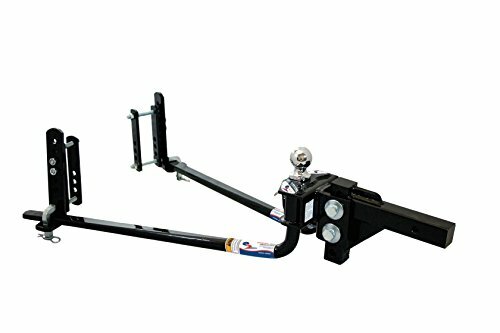 The EAZ Lift Camco Elite weight distribution hitch comes with independent sway control. Included is also a hitch ball with an adjustable ball mount. Weight is distributed with the help of spring bars. Depending on your tongue weight, you can choose between four sizes. 600, 800, 1000, and 1200 lbs. So what does it mean that the sway control is independent? I have gone more into depth in the FAQ down below about this, but in short, it means that the sway control bar is installed and operated independently of the weight distribution hitch. It’s bolted to the trailer frame and the distributing system and will use telescoping arms and friction pads to stop sway once it has begun, which makes it different from a 2 or 4-Point system that delivers more permanent sway control. Something to note when you’re using independent sway control is that you should avoid backing up with it activated as it can damage the system. And out of all models, this is the kind that requires the most installation since you will have to drill into the trailer frame to install the sway control. The EAZ LIFT Camco Elite 48058-A is a weight distribution hitch that will be good enough for most rigs. Fastway e2 94-00-1061 is a 2-Point sway control hitch with round bars. The 2-Point means that there won’t be any add-on sway control that you must install independently. This makes it easier to set up and adjust. The 2-Point sway control delivers more permanent sway control and is okay to use while backing up and during tight turns. Depending on how much your trailer weighs and the tongue weight, you have several options to choose from. Note that smaller systems do not come with the hitch ball included. A 2-Point or 4-Point is a complete solution that I recommend considering. With fewer restrictions while towing and weight distribution and sway control in one, it’s superior to the EAZ Lift for example. After testing several weight distribution hitches, the Andersen Mfg 3350 is my favorite and in my opinion the most superior product on the market unless you go for an extremely heavy duty hitch that costs several grand. There are a few reasons I recommend the Andersen Mfg 3350 over the others. First, it’s almost half the weight of the others. This will not only save you pounds when calculating your gross combined weight but be more friendly to handle and install. Second, the installation is an easy process, and once everything is set up it’s easy to unhitch. Third, a small thing I have noticed that might matter to some is that this solution is much quieter than other systems. Where a 2-Point squeak during turns, this one stays quiet. Last but not least, the sway control. It’s an innovative solution that uses chains for both weight distribution and sway control instead of spring bars. The way it works is that each part is connected and not moving relative to each other. The last product in today’s comparison is from Equal-i-zer. This is a popular system that I have seen a lot of RV dealerships sell, and I understand why. It’s a 4-Point sway control hitch that comes in different sizes depending on your weight capacity. It uses spring bars to distribute weight amongst all axles and is one of the best products to reduce sway. I like this model because once you have installed the brackets on your trailer, it’s a quick process to set up the spring bars. 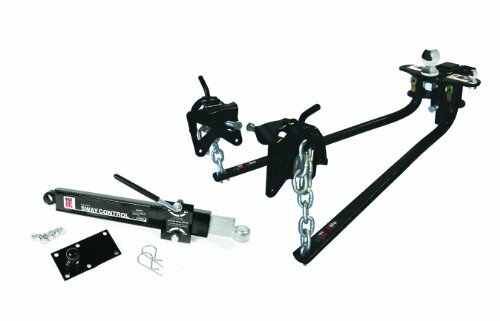 The Equal-i-zer 90-00-1069 is a great weight distribution hitch that is enough for most setups. What the difference is between a 2 or 4-Point is answered in the FAQ below. Note that a ball is not included with all models. If there is anything I want you to remember after reading today’s post, it is that weight distribution hitches and sway control can save your life. The most critical part of RVing is towing safely. Not having to worry about sway when passing a semi or during crosswinds will make your trip more fun and safe. When it comes to recommendations today, I don’t believe you can go wrong with any model I have looked at. Buy what you can afford since even the cheaper models will reduce sway and distribute weight. My recommendation for the best hitch for the money: Andersen Mfg 3350 – The reason I recommend Andersen as the best product for the money is due to the weight, how easy it’s to hitch/unhitch when the brackets are on, and how great it is at distributing the weight while reducing sway. When hitching, instead of pushing and snapping the spring bars into place, you just have to take the triangle plate off and put it on again when hitching up your trailer. It does take some time to get installed at first use, but the ease of use after that initial install is hard to beat. What does weight distributing do? A weight distribution system will combat problems that often occur with standard hitch systems by using spring bars. The spring bars will help distribute the weight to all axles. A standard hitch often pushes down the rear of your tow vehicle resulting in the trailer leaning forward. This is easy to spot standing on the side as the tow vehicle and trailer aren’t level. This not only makes it look unlevel, but it puts extra weight onto your tow vehicle as it will carry more weight of the trailer, increasing the tongue weight. This can make it harder to steer, stop, and also increase trailer sway. You might notice that you see less of the road directly in front of you as your tow vehicle might be facing upward. Before buying a weight distribution hitch, make sure your trailer hitch allows it. If you look at the hitch on your trailer, you will see the capacity listed. If there is none, you won’t be able to use one. 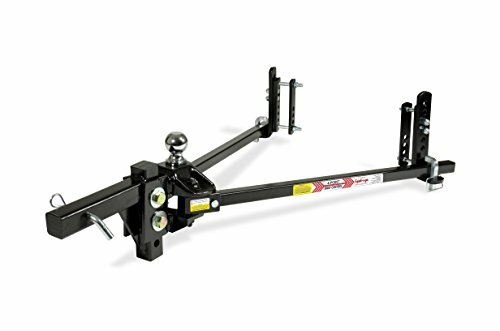 While weight distribution takes care of distributing the weight between your tow vehicle and trailer, sway control helps reduce the sway caused by winds, a poorly loaded trailer, or inadequate spring bar tension in a weight distribution system. Most weight distribution systems sold today come with built-in sway control. This is often done through a 2-point or 4-point sway control that essentially forces your trailer to remain in line during towing. The downward force of the spring bars used in them creates frictional resistance to the brackets installed on both sides of the trailer frame. During normal towing, this resistance is hard to overcome but you can still turn with your trailer. This kind of sway control works to prevent sway altogether, unlike a system that reduces sway only when it occurs. If your weight distribution hitch doesn’t have a built-in sway control, an independent friction sway control can be installed. These are connected to both the trailer frame and the distribution hitch and uses tension to keep the trailer in line. They feature telescoping arms and friction pads to stop sway once it has begun. Note that while backing up, it’s recommended to remove the sway control if you have an independent friction bar to ease reversing and prevent damage to the sway control. This does not apply to a 2-point or a 4-point system. There is also a sway control system called dual-cam sway control which uses sliding devices called cams to suspend the spring bars. They self-adjust and self-center to hold trailers steady during crosswinds. What is the difference between a 2-point and 4-point sway control system? With 2-point sway control you will usually only see sway control at the end of the spring bars on the trailer side. 4-point sway control will have the same parts as a 2-point, but also have sway control where the spring bars mount on the ball side. What are the components of a weight distribution system? Shank – The piece that slides into your trailer hitch. The shank also provides an attachment point for the head assembly of the weight distribution hitch and allows you to adjust the height your trailer sits at. Head assembly – Provides mounting points for the hitch ball and the spring bars. Attached to the channel or bolt holes along the shank. Spring bars – Attached to the head assembly, can be round or trunnion types of spring bars. Transfers load pushing your tow vehicle down to the axles on both your tow vehicle and trailer. 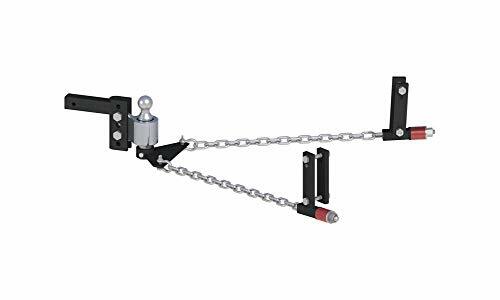 Lift brackets – Mounted to the frame of your trailer and holds the spring bars for example in place most commonly with chains. How do I choose what system to get? Gross trailer weight? Tongue weight? You will run into GTW and TW. These are Gross Trailer Weight and Tongue Weight. The Gross Trailer Weight is how much the trailer weighs going down the road on the way to the campground. This can be measured on a vehicle scale. The Tongue Weight is the weight your trailer puts on the hitch of your tow vehicle plus the weight of cargo placed behind the rear axle of your tow vehicle. The Trailer Tongue Weight is typically 10 to 15 percent of GTW. When picking a weight distribution hitch with sway control you want to choose one that is rated the closest to your actual Tongue weight. You don’t want to get one rated too high or too low. A system with a Tongue weight rated too high for your setup will create a stiff ride (bouncy), while one too low will be unable to distribute the weight properly rendering it useless.